WASHINGTON — The Trump administration sought Thursday to move past the brouhaha over Rex Tillerson’s reported insult of his boss, making clear President Donald Trump alone sets the nation’s agenda that his advisers must execute. A day after the duo’s sometimes difficult relationship burst into public view, the president joined his top diplomat in disputing a report that Tillerson had considered abandoning Trump’s Cabinet earlier this year. Tillerson “never threatened to resign,” Trump tweeted, labelling NBC News’ account as “fake news.” The former Exxon Mobil CEO previously rejected the claim on Wednesday. At the White House, spokeswoman Sarah Huckabee Sanders attempted to address broader concerns about an administration that has been beset by high-profile departures — already including a chief of staff, national security adviser, chief strategist and Cabinet secretary — and persistent infighting that now seems to be pitting Tillerson against Trump’s U.N. envoy Nikki Haley and other top officials. The NBC story, recounted by others, also claimed Tillerson called the president a “moron” after a contentious July meeting of top national security officials at the Pentagon. At the time, The Associated Press and others reported the strains between Tillerson and several of Trump’s closest confidants, such as strategist Steve Bannon and controversial counterterror adviser Sebastian Gorka. Those tensions had subsided somewhat after Bannon and Gorka’s dismissals this summer. But an administration official who has dealt with Tillerson described Trump and others at the White House as growing irritated at Tillerson’s style, which is more restrained than that of the president and can leave the impression he isn’t fully engaged in the discussion. 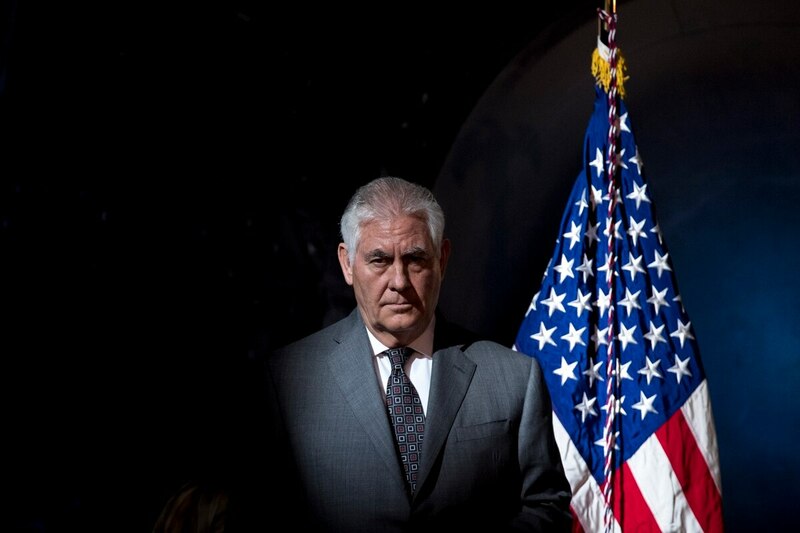 Tillerson also has struggled to adjust to Washington, including the constant barrage of media attention focused his way, the official said, and the reality that he can’t dole out orders the way the Texas oilman did as head of Exxon Mobil. The official insisted on anonymity in order to disclose private assessments of the secretary of state. Asked about the “moron” claim, Sanders echoed the sentiments of Tillerson in declaring it a “petty, ridiculous accusation.” While Tillerson didn’t deny he made such a statement in his uncomfortable address at the State Department on Wednesday, he later had a spokeswoman deny that he ever used such language. Sanders also took umbrage at the arguments of some of Tillerson’s defenders, including the Republican chairman of the Senate Foreign Relations Committee, that Trump has undermined his secretary of state through his often provocative tweets that have interfered directly with ongoing diplomatic efforts. Tillerson tried to settle the question Wednesday in an unusually personal address from the State Department’s staid 7th-floor Treaty Room outside of his office. “There has never been a consideration in my mind to leave,” he declared, without truly putting all questions to bed. Beyond dodging the matter of whether he insulted the president’s intelligence, Tillerson strained unconvincingly to portray himself as content with all his fellow members of team Trump. He pointedly noted the diplomatic successes of Haley, with whom he has been privately clashing for several months. Still, the exhortation in defense of Trump’s “America First” policy was enough for the president. Traveling in Las Vegas, where he met with medical personnel and others affected by this week’s mass shooting, Trump said he had “total confidence” in Tillerson. Even so, Trump has at times appeared to undercut Tillerson’s message on some of America’s most sensitive national security challenges, including Iran and North Korea. Last weekend, as Tillerson was engaged in sensitive talks with top Chinese officials to increase economic pressure on Kim Jong Un’s nuclear-armed government, Trump said Tillerson was “wasting his time” by seeking negotiations with Kim. “Save your energy Rex, we’ll do what has to be done!” Trump declared.